The 'pasta' here is actually wafer-thin slivers of courgette, while the 'cream' is a rich blend of cashew nuts, mint and piquant seasonings. With a vegetable peeler, shave the courgettes lengthwise into long, thin strips - these are your 'pasta'. Keep going until you reach the soft, seedy centre, which you should discard. Set the pasta aside. Put all the ingredients for the cashew-mint cream into a blender and blend until smooth. You will need to scrape down the sides with a spatula and reblend a few times. Add a little more oil or water if necessary. 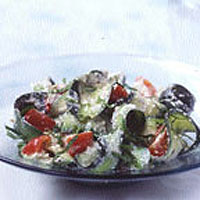 Toss the courgette pasta with the cream and scatter the cherry tomatoes on top. Serve drizzled with a little more olive oil and some freshly ground black pepper.